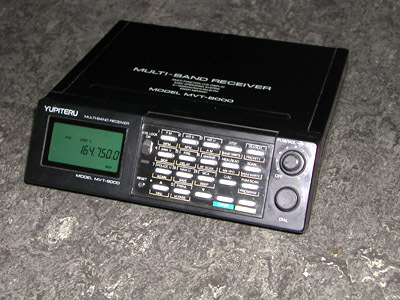 The Yupiteru MVT-8000 uses the SMD-version of the MC3361, with the discriminator outpunt on pin 9. This IC is mounted on the bottom side of the main PCB. 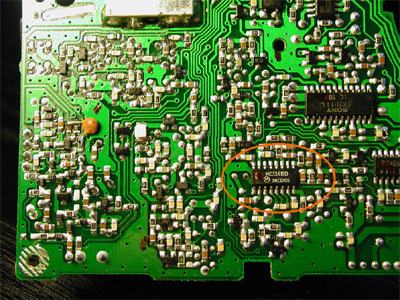 To reach the IC, all screws should be removed from the main PCB. 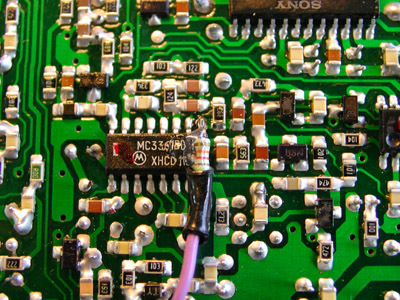 To make it easier, it is also advisable to disconnect a couple of PCB connectors. One lead of a 'safety resistor' of 12 k (the exact value is not critical, I use values between 5,6 and 15 k) is bent to follow the IC's pin exactly. Then, the resistor is connected to pin 9 of the IC using a fine tip soldering iron and a minimum amount of solder. The resistor is fixed to the IC with a drop of glue from a glue gun. This prevents damage to the IC pin when inadvertedly mechanical stress is applied to the resistor. Regarding the short distance between the MC3361 and the 3.5 mm chassis terminal (about 3 cm - 1.2'') I used a piece of unshielded insulated wire. A small piece of shrink tube prevents short-circuiting the discriminator output to the scanner's metal bottom plate. The 3.5 mm chassis terminal is mounted on the back of the scanner, between the loudspeaker and DC terminals. 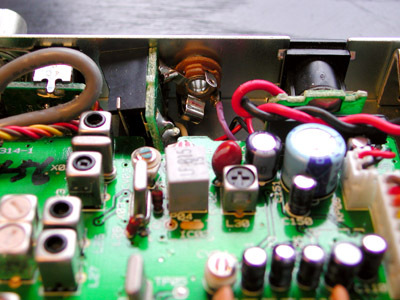 The ground lug is connected to the ground of the loudspeaker terminal.